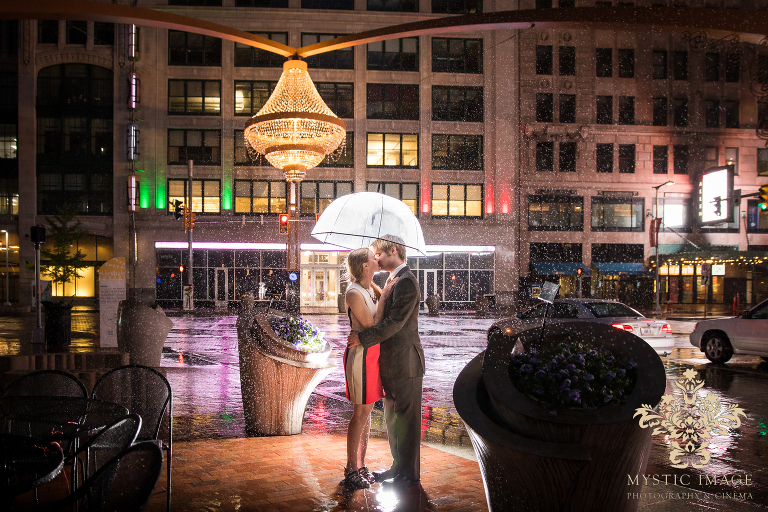 What do you get when you mix an evening photo session with 30 degree temperatures, heavy rain and wind gusts up to 37 mph? 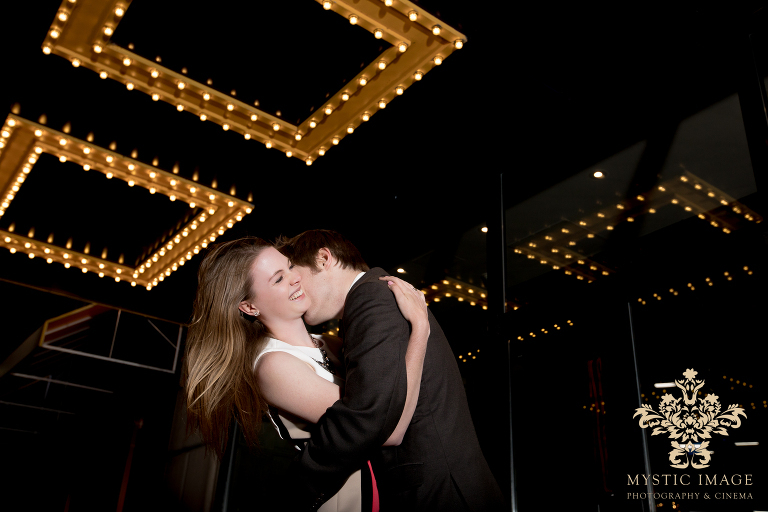 I bet you wouldn’t guess a super unique engagement shoot, but that is exactly what we got on Leah and Colin’s session at Playhouse Square. 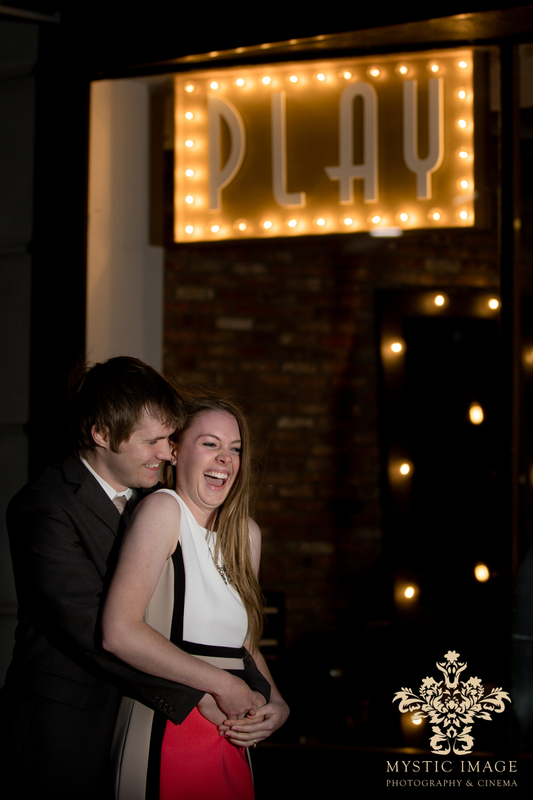 Since Leah was still attending school in Columbus, we struggled for months trying to settle on a date that would work for everyone. We would schedule, then reschedule, then reschedule again… there always seemed to be something standing in our way. We must have rescheduled at least 4 times before finally committing to an evening in May. Downtown events were at a minimum, Leah would be able to drive up for the weekend, and nighttime shots in front of the chandelier would be amazing! Plus, historically, the weather in May has always typically been on the mild side. We were all super excited… this session was actually going to happen! Well… we do live in Cleveland and as I had mentioned, Mother Nature decided that she wasn’t going to cooperate with us that evening. The rain, wind and cold temperatures were harsh, but sheer will and determination reigned supreme that night. Leah and Colin were absolute troopers. The patience and positivity that they maintained throughout our entire session was unparalleled. I couldn’t have asked for a more wonderful couple to tough it out with. Leah and Colin, we cannot wait for your upcoming wedding. The two of you have proven yourselves to be beyond amazing and so easy to work with. We are so excited to be capturing your hopefully warm and dry day!